Helping You ACE Your Police Exams! Here are the leadership textbooks and exams you should use to prepare for your promotion in a police or sheriff's department. Exams with over 500 questions, from over 100 great textbooks, are now available. There are also other resources listed YOU need to develop YOUR law enforcement leadership skills! What are the best textbooks to study TODAY for YOUR police leadership exam? "I have not ever written, and will never write, a single promotional exam question on the topic of leadership from a book written by someone who has not experienced the unique responsibility for the outcome of their decision during a law enforcement life and death incident." Yes, leadership can be learned, and developed. There are some persons more able to lead than others are - but no aspect of leadership knowledge and skill is out of reach for the modern law enforcement supervisor, manager and administrator if they are willing to develop the knowledge and skills needed. Promotional Exams for any or all of the great textbooks listed on this page can be taken by you to use as study material within the Advanced Police Promotional Testing Course at PoliceCareer.com. You can also practice with a police sample in-basket assessment. Try a few short, sample exams and online flashcards - at no cost. You'll receive an email with your login in the next few minutes. Then learn more about our exams and study system. There is an immense volume of information on leadership. However I am going to focus on Police and Law Enforcement Leadership exclusively. Why? Well, those trendy touchy-feely leadership books written for the business market, in my humble opinion, are no match for the leadership titles written by lifelong, dedicated law enforcement professionals who have lived the life, talked the talk, and walked the walk. I have read many of them, as well as all the police leadership titles below. I have not ever written, and will never write, a single promotional exam question on the topic of leadership from a book written by someone who has not experienced accountability for the outcome of their decision made during an actual life or death incident. I have read all the non-police leadership books. They are all fine, well written and informative books. I simply don't believe they compare to the 6 leadership books below, all of which were written by experienced law enforcement professionals and leaders. "What about the U.S. Military leadership books?" you ask. Great question. Our missions are similar. Many law enforcement leaders have had distinguished military careers. They know all about life-and-death decisions under stress, and they certainly stand accountable for those leadership decisions. Still - no. We should not be writing our exams from their army field combat, S.E.A.L. or submarine leadership textbooks, and they should not be writing their military leadership exams from our civilian law enforcement leadership textbooks. We are on the same ocean, but not in the same boat. Steers differently. No. I continue to read military leadership books as they are published. One day I may change my mind. Email me with your serious comments and suggestions and I will reply. I needed to get that out of the way. It is only my opinion. Many promotional test writers strongly disagree with me. To each his own. For now, if you are looking for any non-police leadership books, none are listed here. My BEST piece of advice on this page? Simple - if you are heading to a supervisory or management promotion of any type - buy and read all 6 of these police leadership books - NOW. Challenging the Law Enforcement Organization - Proactive Leadership Strategies by Jack Enter, Ph.D. From me; Great book. Well written, no jargon. Short enough but not too short. You should read it, then put it down for a month or two, then read it again. From the publisher; Among the topics discussed are chapters on the impact of living and policing an unskilled and violent society, why law enforcement managers fail to successfully impact their agencies, and chapters on self-management, communication, motivation, and being more effective in our personal lives. Many of these latter “strategy” chapters have examples of proactive techniques used by law enforcement managers as well as “action items” to apply the principles examined in each chapter. Visit us for the Challenging the Law Enforcement Organization exam, test questions, study guide and flashcards. Effective Police Leadership - Moving Beyond Management, by Thomas E. Baker. From me; An older but still very important leadership book I have used often to write a police leadership exam. From the publisher; In this much-anticipated 3rd Edition, Tom Baker expands on the revolutionary leadership insights that made his first two editions so popular. This enhanced and expanded version explores even more strategies that help agencies, administrators and officers leverage crime data more efficiently and effectively. From explaining what a leader must be, do & know, to plans for putting expert-level leadership skills to work immediately, Effective Police Leadership is gold for law enforcement leaders. Great leaders aren't born, they're made...and this book makes them! Visit us for the Effective Police Leadership exam, test questions, study guide and flashcards. From Me: Excellent new title with an emphasis on applying classic studies of leadership and police management to the new organizational problems law enforcement faces today. From the publisher; Built on a foundation of nearly 1,200 references, Leadership and Management in Police Organizations is a highly readable text that shows how organizational theory and behavior can be applied to improve the operations, leadership, and management of law enforcement. Author Matthew J. Giblin emphasizes leadership and management as separate skills in successful police supervisors and executives, illustrating to students how the two skills combine to improve individual and organizational efficacy in policing. Readers will come away with a stronger understanding of why organizational decisions matter and the impact research can have on police departments. Visit us for the Leadership and Management in Police Organizations - Giblin 1E exam, test questions, study guide and flashcards. Leadership, Ethics, and Policing: Challenges for the 21st Century - Patrick J. Ortmeier and Edwin Meese III. From me; A classic often-cited and used textbook in law enforcement promotion. From the publisher; From street cop to chief, this guide develops a wide-range of ethical leadership skills applicable to all police ranks. Moving beyond incident-driven techniques, the book embraces problem-oriented, intelligence-led policing and integrates both ethics and leadership concepts. This edition includes two new chapters to address today’s environment–one on Homeland Security and one on strategic policing. New case studies, examples and applications appear throughout the text and help officers develop essential ethical leadership competencies. For courses in Police Leadership, Administration, Management, Ethics and Supervision. Visit us for the Leadership, Ethics, and Policing exam, test questions, study guide and flashcards. Police Leadership - Organizational and Managerial Decision Making Process - Maria R. Haberfeld, Ph.D. From me; An excellent work that is under-rated and under-utilized. From the publisher; Police organizations are much more accountable to their publics than ever before. Police Leadership: Organizational and Managerial Decision Making Process examines why and how decisions are made and what can be done to direct current and future law enforcement leaders to rethink and adjust their decision making processes to keep up with the demands of our constantly changing society. The text discusses how police organizations function and respond based on the type of leadership and driving policies present in police organizations, and provides ideas about the best ways of dealing with the challenges and organizational problems that police agencies face every day. Visit us for the Police Leadership exam, test questions, study guide and flashcards. Managing and Leading Today's Police: Challenges, Best Practices, and Case Studies provides a comprehensive insider’s view into the challenging work of police leaders at all levels of management. Using a problem-based learning approach, the authors draw on their extensive practical experience to critique the organizational, personnel, and operational issues facing police agencies and to assert “what works” in contemporary police management. The 4th edition is a major revision, moving from a supervision to a management perspective. It covers new policing strategies, methods, and technologies transforming the field and demanding new knowledge of police supervisors, managers, and leaders. Managing and Leading Today's Police: Challenges, Best Practices, Case Studies - Peak 4E exam, test questions, study guide and flashcards..
Police Administration - A Leadership Approach - Ortmeier, Davis. From me; A comprehensive work on management, with some focus on leadership. Definitely worth your reading time, especially for captain and higher ranks. From the publisher; Police Administration: A Leadership Approach was written to support the need for a text that addresses supervision and management as well as ethics, leadership, and the principles of policing that form the foundation for efficient, effective, and lawful administration of the modern police service. Unlike other texts, this book blends theory with practice. It presents a foundation for the administration and management of a police agency in a logical, flexible, and understandable step-by step process. Visit us for the Police Administration - A Leadership Approach exam, test questions, study guide and flashcards. Paradoxes of Leadership in Police Management - Douglas Perez and Michael Barkhurst. From me; This book is a little out of the mainstream of police leadership titles, but that's what makes it so interesting. The book is centered on the concept that every leadership action or decision will likely have negative unintended consequences, and each decision does in fact create often hidden "paradoxes." This book helps spot and act on those paradoxes. I found it a very good read and worthy of police promotion exams. From the publisher; This book helps current police leaders, and would-be leaders, as they strive to effectively direct a group of unique and powerful individuals: police officers. The work day of a police officer is replete with paradox, making the job of leading police difficult and potentially frustrating. This book provides real life examples based on a theoretical framework. This book discusses the police officer's experience including the multiple, conflicting, and sometimes vague nature of police functions and goals; the creation of mission statements; organizational structures; teaching communication skills to young officers; coaching and mentoring police officers; and the complicated job of assessing the job done by law enforcement. The book also deals with the development of police ethics, comparative accountability mechanisms, and alternative modes of discipline, expanding these discussions into a three-tiered view of police leadership (the roles of sergeant, middle manager, and chief). Visit us for the Paradoxes of Leadership in Police Management exam, test questions, study guide and flashcards. Promotional Exams for all these great police leadership textbooks can be taken by you to use as study material within the Advanced Police Promotional Testing Course at PoliceCareer.com. Sign up for our police promotion newsletters. You will be able to take free promotion exams online to try out our system, and also receive information on police oral boards, in-basket and assessment center topics. Send me written exam, oral board and assessment center questions you have faced - one of the column features is that I will research and comment on written exam or assessment center questions you have heard, answered or encountered and that you are unsure or curious about. We will be glad to give you our expert opinion on questions you have seen asked on exams and exercises. Send your questions to me directly - Paul@PoliceCareer.com. You will never need to worry about links, downloads and privacy on this site or any of our other sites. We always use a secure and encrypted "https://" link (check the address bar) and have earned the McAfee SECURE certification. Here is our Privacy and Security Policy. The #1 BEST WAY to Prepare for Police Promotion Exams? Study the Textbooks! What is the usual response to the problem employees? A requires the positive participation of too many people. B is anathema within any organizational culture. C is contrary to human nature and rare in the law enforcement culture. A you have taken the first steps toward true leadership. B you will always fail as a leader. I am Lt. Paul Patti (ret). I was in law enforcement for 27 years, retiring as third-in-command of a 145-person law enforcement agency. Since 1985 I have been owner and Director of Police Career and Promotion Services, LLC. Read more. The seven laws of leadership are listed below. Which one is applied when an evil manager models "do as I say, not as I do?" The seven laws of leadership are listed below. Which one is applied when a leader is mentioned as "always taking responsibility when things go wrong?" Police Leadership Oral Board Question 1 - You need to STAND OUT- so Get Creative! Question 2 - How Do You Lead? A very special and loud "Thank You!" 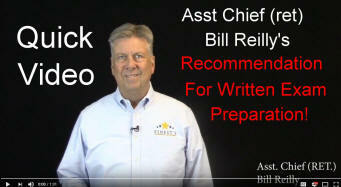 goes to our affiliate, Assistant Chief Bill Reilly (ret) of Finests.com for producing and allowing the use of these exceptional police promotion oral board instruction videos. How would YOU describe your knowledge and experience in Criminal Investigation?" "Ever since my first days in field training, and then while on patrol on my own, I have excelled in report writing and investigative techniques. I pushed myself to learn all about physical evidence, scientific methods of evidence collection, and all the latest information on witness and suspect interrogation. Most important, if ever time permitted, I always followed up and took an investigation as far as I could, a great many times making an arrest on a case that normally would have been turned over to a detective. There is nothing I aspire to more than putting all these talents to work in our agency's detective division." Visit us for Exams, Test Questions, Study Guides and Flashcards from Your Law Enforcement Textbooks!